1Post Graduate and Research Department of Botany, Jamal Mohamed College (Autonomous), Tiruchirappalli-620020, Tamil Nadu, INDIA. 2Department of Microbiology, School of Life Sciences, Bharathidasan University, Tiruchirappalli-620024, Tamil Nadu, INDIA. 3Post Graduate and Research Department of Botany and Microbiology, A. Veeriya Vandayar Memorial Sri Pushpam College (Autonomous), Poondi-613503, Thanjavur District, Tamil Nadu, INDIA. 4Post Graduate and Research Department of Chemistry, Jamal Mohamed College (Autonomous), Tiruchirappalli-620020, Tamil Nadu, INDIA. Introduction: In traditional Indian herbal medicine, the plant Indigofera aspalathoides (Vahl.) has been used to treat various human ailments. Methods and Results: Various phytochemical compounds (Rf value) such as Tannin (1.14), Flavonoid (1.14), Saponin (0.87), Sterol (0.88) and Phenol (0.86) were found in the leaf extract. The antimicrobial effects of the phytoconstituents were examined for three bacterial and fungal species. The highest anti-bacterial and antifungal activities were found in flavonoid compound, where the maximum zone of inhibition was recorded in Staphylococcus aureus 18mm compared to positive control chloramphenicol (24mm). 13mm observed in A. flavus and A. ochraceous where positive control streptomycin exhibits 18mm. 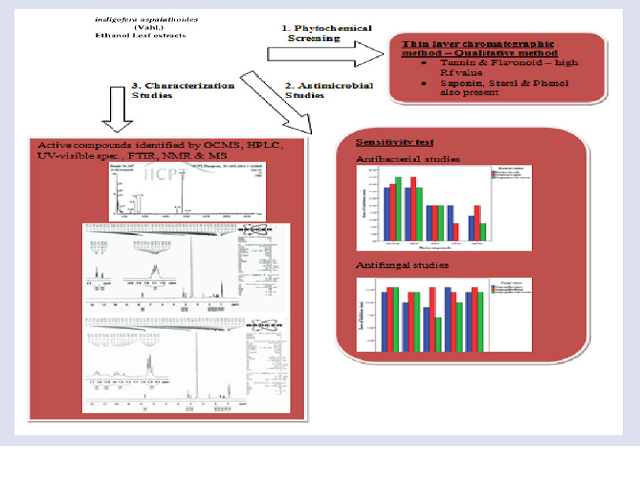 GC-MS analysis revealed the presence of three major compounds in 8α (2H)-Phenanthrenol, 7-ethenyldodecahydro-1,1,4α, 7-tetramethyl-, acetate, [4αs(4αα, 4bα, 7α, 8αα, 10αα)], Benzoic acid, 4-methyl- , 2-oxo-2- phenylethyl ester and Cyclohexanol, 5-methyl-2-(1-methylethyl)-, [1S-(1α,2α,5α)] in the crude extracts. The preparative HPLC analysis proved the presence of single peak from the crude flavonoid compounds, where the absorption maximum was between 207-290nm exhibited by the UV spectrum analysis. FTIR spectrum confirmed the presence of amide group, phenol group, carboxylic acid, alkynyl, alkene and aromatic ring. NMR studies proved the presence of phenyl group, methyl group and H2C-CH group and their molecular weight recorded as 353 through the mass spectrum analysis. Conclusion: The identified compound considered as the vital compound to design the “green antimicrobial drugs”. Kumar TT, Salique SM, Ilyas MH, Thajuddin N, Panneerselvam A, Padusha MK, et al. Phytochemical Screening and Antimicrobial Studies in Leaf Extracts of Indigofera aspalathoides (Vahl.). Pharmacognosy Journal. 2018;10(6):1208-1215.